Picture yourself sitting inside your vehicle in the middle of a building, surrounded by large coolers of ice cold beer, wine and beverages, racks filled with your favorite beach munchies and colorful shelves of world-famous T-shirts lining the walls. This is all part of the Brew Thru experience! 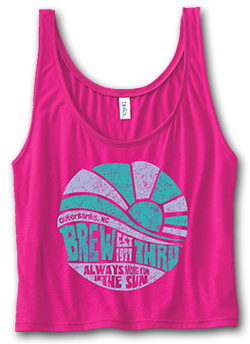 At this iconic Outer Banks destination, the Brew Thru car tenders grab your beverages and snacks, help stock your cooler and assist you in picking out your Brew Thru souvenirs — all while you relax in the comfort of your car. It’s an ideal way to shop! 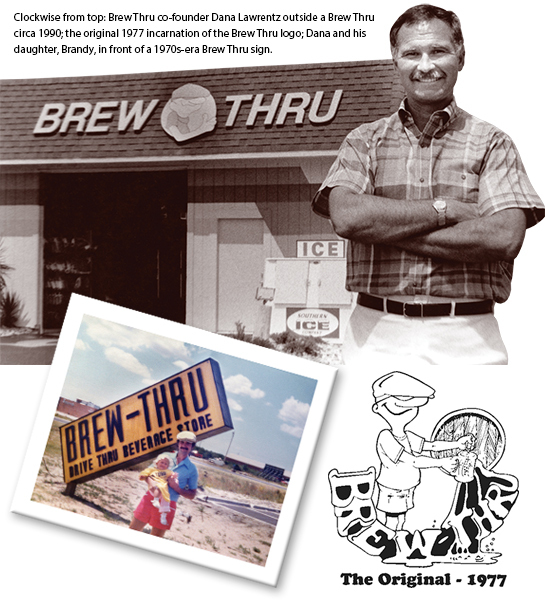 The vision for the Brew Thru experience began in the mid-70s when Dana and Becky Lawrentz, originally from Ohio, decided to open a drivethrough store on the Outer Banks. Dana and a buddy came down together with a little bit of savings and a loan to construct the original Brew Thru in Nags Head. For about six months, the partners drove to the Outer Banks every week on Sunday night and worked on the construction of the drivethrough until midday on Friday, when they would head back to their families in Ohio. 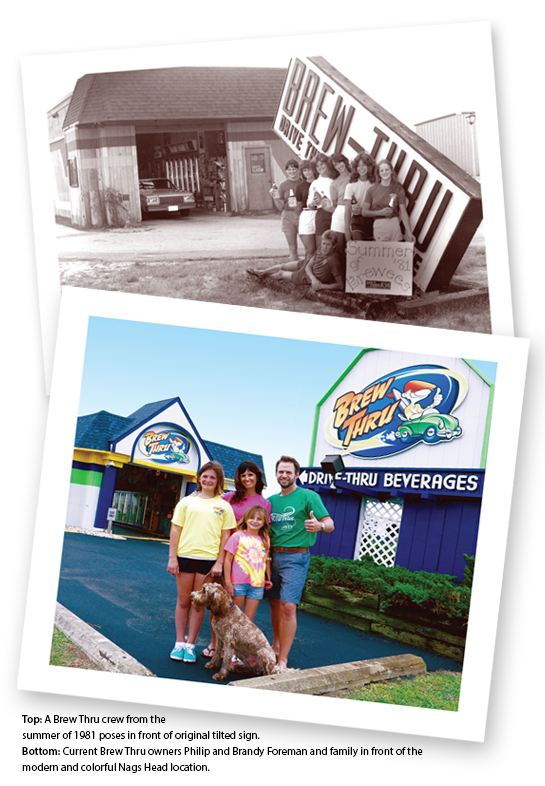 Finally in June of ’77, the families packed up everything and moved to the Outer Banks to open Brew Thru for the summer. That first season, the inventory consisted of your typical convenience store items like beer, non-alcoholic beverages and snacks. Dana and his business partner quickly realized it was going to be tough to support two families in the beer business, so Dana bought out his partner that winter. The next spring a gentleman from a screen-printing company came through and insisted Dana should sell Brew Thru T-shirts. Dana wasn’t sure at first, but the gentleman offered to supply his first box of shirts for free. The entire box was sold that very weekend, and Dana realized then and there that he wasn’t just in the beer business but also in the T-shirt business. 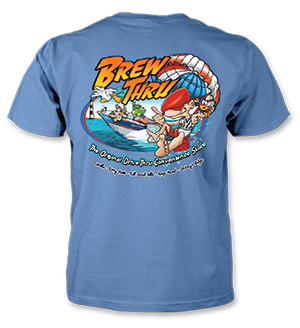 The annual Brew Thru T-shirt has become a favorite Outer Banks souvenir. In the early-90s, Brew Thru started coming out with other designs in addition to the annual design, which changes every year for Brew Thru enthusiasts and collectors. The annual depicts several beachy characters including Big D, representative of the founder himself, enjoying Outer Banks pastimes. Other designs showcase the lighthouses or a popular trend of the season. Even with the vast selection, the annual is still the biggest seller today, accounting for about 50 percent of the more than 100,000 shirts sold every summer in Brew Thru stores. It’s very typical to see visitors come in and purchase 15 or 20 annual T-shirts in an array of colors and sizes for the entire family! Dana established quite an experience on the Outer Banks, but you won’t find the original Big D at Brew Thru anymore (although we hear he may pop in from time to time). His daughter, Brandy, and son-in-law, Philip Foreman, bought the business in ‘02. Philip and Brandy started dating in the ninth grade. Brandy was always involved in the business, but it wasn’t until mid-way through college that Dana convinced Phillip to work in one of his stores for the summer. He knew right away that he was good at selling T-shirts and helping customers enjoy the fun, shopping experience. Since taking over ownership of Brew Thru, the Foremans have added a fifth location in Kill Devil Hills. 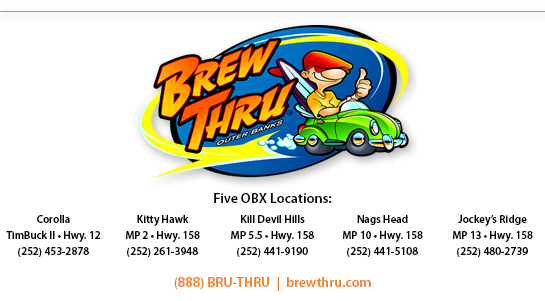 Now Brew Thrus are located in Corolla and Kitty Hawk, as well as at two locations in Nags Head. They’ve also opened the Brew Thru Shop in Kill Devil Hills to allow patrons to shop at their leisure for additional Brew Thru apparel and gifts that can’t be found at drive-through locations. Because of the vast selection of items at Brew Thru, they have created the Summer-y (a play on the word “summary”). The original, single-fold brochure depicted the Brew Thru items available for purchase. Now the Summer-y is a much larger menu showcasing Brew Thru souvenirs, beer, wine, cigars and more. It helps shoppers see all that is available so they can plan the perfect Brew Thru experience. The staff’s favorites, also known as Big D’s Picks, are denoted by a thumbs up in the Summer-y. Brew Thru prides itself on excellent customer service. The staff members are all very knowledgeable about their products and are anxious to help while having fun at the same time. Brew Thru is very thankful to be part of such a wonderful beach community and loves to give back. 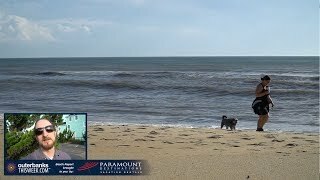 Since the Foremans purchased the company, they have donated more than $200,000 to various local and national nonprofits like the OBX Get Pinked! 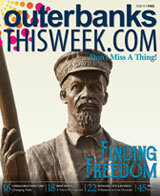 Campaign, the Outer Banks Relief Foundation, the Dare Education Foundation, March of Dimes and more. Both Philip and Brandy serve on several local boards and are active participants in many local charitable events. Brew Thru has a massive selection of nearly 100 different brands of beer, including imports and domestic micro-brews, many brewed right here in North Carolina. Whatever your taste, from ciders to wheat, kolsch, lagers, ales, IPAs, stouts or porters, Brew Thru has something in the coolers for you! Brew Thru’s wine list covers the grape from champagne to reisling, pinot grigios and chardonnays to malbecs, pinot noirs, zinfandels and everything in between, including wines made from North Carolina’s own muscadine grapes. If a good smoke is part of your Outer Banks experience, check Big D’s Humidor for top-notch cigars.